Researchers of the CONICET participate in a project with schools to control water quality of rivers and streams in the province of Tucumán. Water is tasteless, colourless and odourless; and it is more than two hydrogen atoms bonded to one oxygen: it is essential for the development of life. Although it covers more than 70% of the land surface, only 1% of the fresh water is available because the rest is mainly in the sea and the poles. Thus, water is a very scarce resource so it must be looked after and used rationality. In order to determine its quality, experts usually resort to physicochemical parameters such as dissolved oxygen concentration, odour, turbidity, pH and so on. Nevertheless, biological indicators such as the analysis of aquatic insect communities to determine the environmental state of the rivers are increasingly used to determine water quality. This option has great advantages: it is easy to collect samples; it has low cost, and others. “The fact that these organisms live in the river makes an essential difference when compared to a chemical sample: animals tell us what is going on and what happened to them in the recent past- days or weeks – in the water. The main benefit is that the insects act as “guards” since they are always in the site and can manifest if there are any specific pollution events”, Carlos Molineri, associate researcher of CONICET at the Instituto de Biodiversidad Neotropical (IBN, CONICET- UNT) [Institute of Neotropical Biodiversity], says. The scientist, together with Daniel Dos Santos, assistant researcher of the CONICET at the same institute, and biologist Celina Reynaga work in an educational project to record and monitor the insects of the rivers and streams close to the Raco district in Tucumán, in order to raise awareness in the community about the importance of protecting water resources. This initiative is the result of a joint action between the IBN, the ‘Hermanos de la Tierra’ [Brothers of the Earth] association and the University Voluntary Service of the Facultad de Ciencias Naturales [Faculty of Natural Sciences] of the Universidad Nacional de Tucumán (UNT) [National University of Tucumán] Furthermore, 13 schools from the northeast of the province participate in the project. These schools are located in foothill and mid-mountain regions. The researchers are in charge of training the teachers in the use of useful tools to perform educational activities on environment with their students. The idea is to focus on plants and animals that could serve as biological indicators of water pollution. 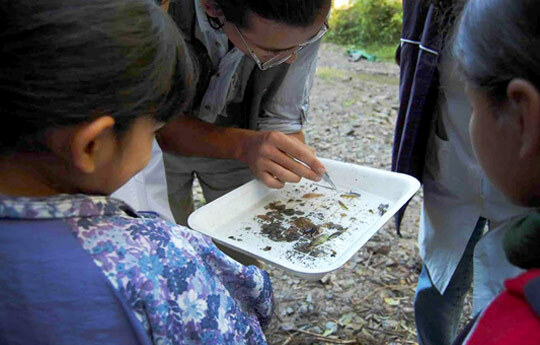 Reynaga states that before the outings to the rivers and streams the children attend some training to know how to look for the aquatic insects that belong to the four groups easily observable: bigeyes (megaloptera), stoneflies, caddisflies and riffle beetles. The children use a fine mesh strainer to collect the species and classify them with a special form that guides the kids in the observation. “The study is conducted directly in the field. Insects are collected and then children calculate a very simple index in which they add a point for any of these organisms that appear and determine the ecological state of the river. If the four groups appear, it means that the water is excellent, but if there is none, it is polluted. These types of activities are done not only for educational purposes but also scientific, since we use the information for monitoring”, Molineri explains. Likewise, the children, the parents and the school community usually actively participate in the project and state that the causes of pollution can be solved. For this reason, the schools are developing a method to purify the waters with aquatic plants whose roots block the water draining through the irrigation canals before they reach the river. Apart from the educational work by providing the community with advice on how to look after the quality of the water, the researchers conduct studies on taxonomy, phylogeny, and biogeography of aquatic invertebrates. The scientists collect samples in the same rivers and streams where the school students carried out their tasks but with different types of nets and light traps. After that the samples are placed in a container with alcohol and labelled with the information on the collection for further analyses at the laboratory. Regarding that, Dos Santos highlights that the microhabitats are carefully analysed to undertake an extensive survey. The researchers take samples of winged adults at noon and aquatic nymphs to obtain more details about the life cycles of insects. Furthermore, as some species live under the stones, they have to be removed so that when the water runs they are caught with a net. “Basically, there are two great environments in a mountain river: deep pools of calm waters; and rapids, where the water flows faster. The insects have different preferences; some take advantage of everything the current brings, and others live on what remains in the riverbed. The stones are also very different, if they emerge, they heat up and act like a heat conductor”, the researcher adds. Furthermore, the scientists analyse the behaviour and structural changes of the community of insects and determine the biological, physiological, histological and genetic changes these insects have in response to the changes in the ecosystem. Reynaga comments that her work consists in studying the eating habits of each organism that lives under the water and with that information make a food web to evaluate how the system works, what they eat and obtain environmental indicators. “These studies are really significant because, for instance, some diseases can be transmitted by insects whose larva is aquatic, such as mosquitoes or midges. Insects like caddisflies and dragonflies are fed on larvae and that is why its presence is useful to control the population of these potentially dangerous species”, Dos Santos concluded. Carlos Molineri. Associate researcher. IBN. Daniel Dos Santos. Assistant researcher. IBN. Carolina Nieto. Associate researcher. IBN. Daniel Emmerich. Asociación civil “Hermanos de la Tierra”. Fátima Romero. Fundación Miguel Lillo. Judith Babot. Fundación Miguel Lillo. Ana Lucía González-Achem. Doctoral fellow. UNT. Guillermo Hankel. Doctoral fellow. UTN.